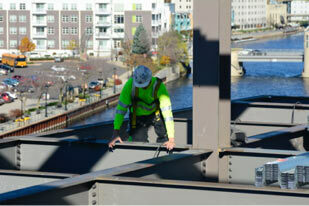 As a subconsultant, Fickett Structural Solutions (Fickett) was hired to perform structural steel inspections on the $33 million, 113,000-square-foot, 5-story office building on the former Laacke & Joys location along the Milwaukee River in downtown Milwaukee, Wisconsin. The nondestructive testing (NDT) methods used for the field inspections on this project were in accordance with the requirements of the American Welding Society (AWS) D1.1 Structural Welding Code—Steel. 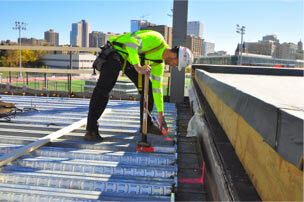 Visual inspection (VT) was used to inspect the composite decking including; the shear studs, puddle welds, and side-lap connections. Ultrasonic testing (UT) was used to test the complete joint penetration (CJP) welded connections which were detailed for the moment connections and column splices. VT was also used to inspect the beam to imbed fillet welded connections, the hollow structural section (HSS) tube steel bracing fillet welded connections, and the bolted connections. Inspection reports were provided after inspections were completed.